At the heart of the Camargue Regional Park and Nature Reserve the museum illustrates the diversity and wealth of this territory. It explains its origins, the challenges the Camargue faces and its future. Housed in an old sheep barn, the museum is also the departure point of a footpath that will enable you to see the fauna and flora of the Camargue close up. Opened to the public in 1979, set in the middle of the Camargue and converted from an old sheep barn, the museum retraces the development of human activity in the Rhone Delta from the 19th century until today. A large part of the permanent exhibition depicts 19th century life in a typical farmhouse (agriculture, breeding, hunting, fishing, celebrations and traditions…) and the economic activities that developed over the 20th century (hydraulic works, viticulture, rice growing, sea salt production…). The museum’s aim is to provide visitors with a good introduction to their visit to the Camargue Regional Park and Nature Reserve, which is a particularly fragile territory. " To know and make known in order to protect better" is one of its objectives. 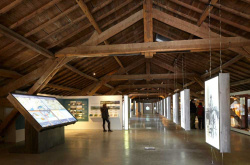 In addition to visiting the museum there is a 3.5km walk through the grounds of the Mas du Pont de Rousty (contemporary agricultural activities, farming, pasture lands, marshland, reed-beds, traditional huts…) with explanatory panels, observatories and information areas. Le musée est ouvert tous les jours sauf le mardi, le 25 décembre, le 1er janvier et le 1er mai.